i3 window sealant systems provide an effective interaction of the outer, middle and inner sealing levels, using various combinations of six Tremco system components. 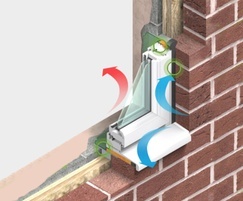 They provide externally weather-proof systems, which also prohibit the warm, internal air penetrating the joint and forming condensation, a problem which can lead to a reduction in the level of thermal insulation, damage to building components and mould formation. They exceed 600Pa driving rain tightness, as per DIN EN 1027 and DIN 18 542, and are airtight to UK Building Regulations and DIN 4108-7.